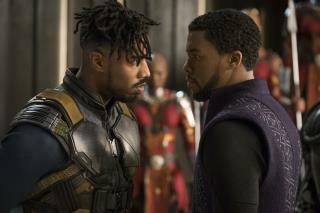 (Newser) – Michael B. Jordan received high praise for his role as Black Panther's supervillain, but he wasn't feeling so hot after filming wrapped. "Therapy, just talking to somebody just helped me out a lot," the 31-year-old actor tells Oprah Winfrey in a SuperSoul Conversations interview to air Feb. 16 on OWN. Jordan says he dug into "pain and rage and all those emotions … from being black and brown here in America" to prepare for the role of Erik Killmonger, per USA Today. Black Panther is "an extreme, exaggerated version of the African diaspora from the African-American perspective," he adds. "That was something I didn't take lightly." Some of these comments are disgusting and the very reason why we can't get rid of racism in this country. You refuse to believe there is disparate treatment in America towards people of color vs how white people are treated and that there are actual psychological affects for people of color because of it. The 'thug" mentality is a direct result of stratification (look it up) and a whole lot more but I won't waste my time going into detail I'll just say to continue to ignore it will be to the detriment of society. As for Heath Ledger, sadly he died before he was able to seek help (or maybe as a result of) after playing such a dark character and the depth of emotions he had to use to create that performance. Perhaps some of you people should look more deeply before replying with such glib comments about things you have no clue of nor desire to find out about. Big Shocker there, another Hollywood 'Drama Queen / Drama King'!